Each week, I will be providing a glimpse into the discipleship training program that I have just started. This is a way for me to show you what I am learning and also allow you to progress along with me. For more information, I encourage you to read this. Also, if you like what you are reading, will you consider donating so I can continue with the program and be able to provide more interesting content so we can all reach true Christian maturity. Why am I writing this blog? Why am I spending so much screen space and digital characters on Growing Up? Because Growing Up is hard to do and few people try to show you how to do it. Too many times, the only advice that is given is to pray more and to read your Bible more. There is nothing wrong with this advice, and much benefit can come from doing these two things but the advice neglects trying to understand how human beings work, our unique giftedness under God, and best practices from 2,000 years of Christian living. James Bryan Smith, in his Apprentice book series, reveals what he calls the Triangle of Transformation. 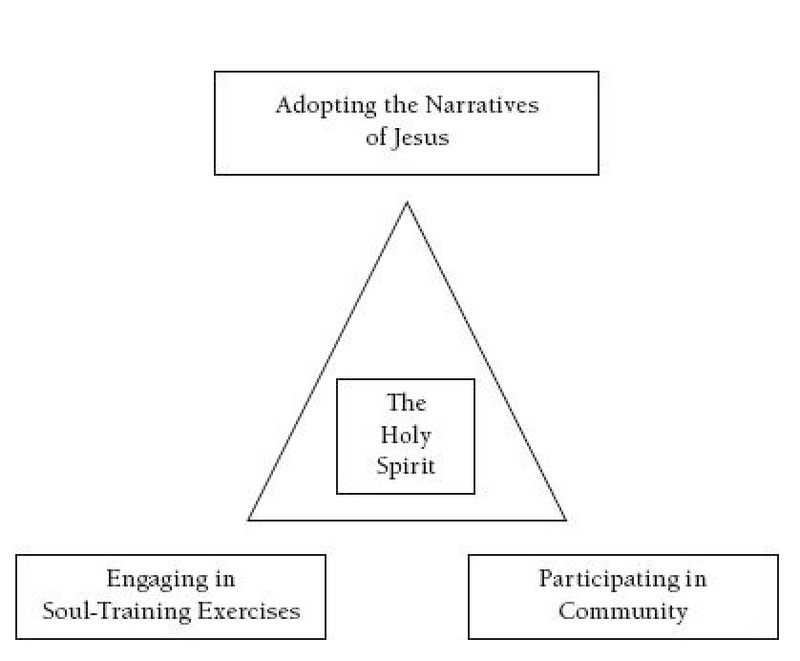 There are four components of the triangle – Adopting the Narratives of Jesus, Engaging in Soul-Training Exercises, Participating in Community, and the work of the Holy Spirit. Do you see how this is a much more well developed and robust approach to Growing Up? Scripture reading and prayer are important parts of developing the right narratives and are essential exercises but they are just a few elements that make up the Growing Up process. The four components of transformation show us how the Holy Spirit works through a small group of believers, how other spiritual exercises work the right spiritual muscles, and how learning from Jesus how he thought and spoke about his Father help bring clarity and focus to our attempts at Christian maturity. What about you? Which component have you been neglecting? Let me know if there is an element of Growing Up that you might need some help with. I will be happy to show you what I know and am attempting to practice. This entry was posted in Uncategorized and tagged Christianity, james bryan smith, Jesus, maturity by Scott Jeffries. Bookmark the permalink.